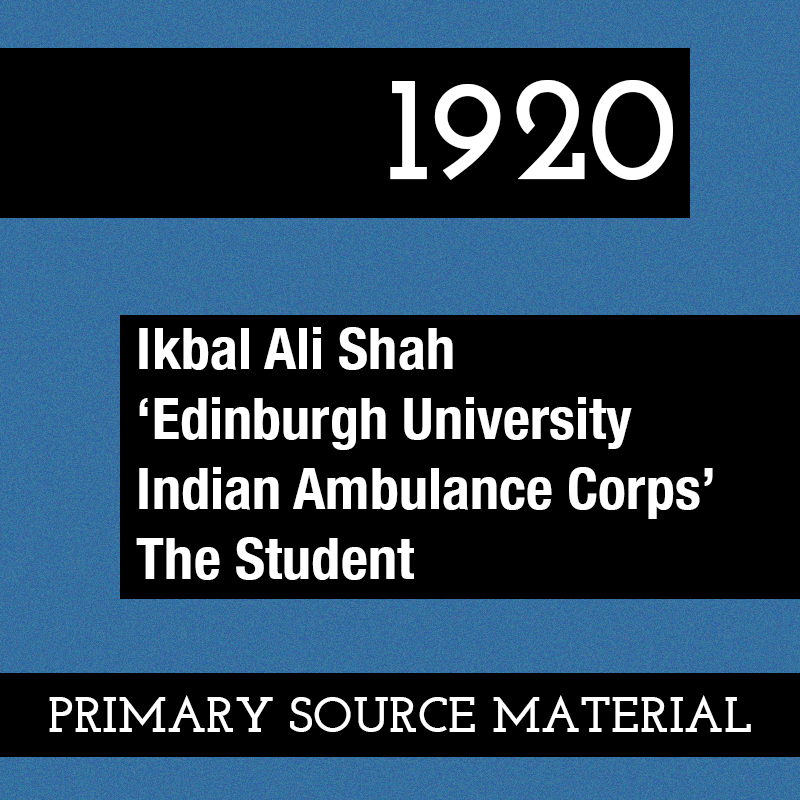 Primary source material reproduced from Ikbal Ali Shah, ‘Edinburgh University Indian Ambulance Corps’, The Student (special war memorial edition, May 1920). The Edinburgh University Indian Ambulance Corps played an important role in hospitals throughout World War I. Their actions were used by Ali Ikbal Shah to argue for reforms within the British empire in 1920. Many of the Indian students were nearing the final stages of their respective courses of study, but so were others, and they had left all near and dear to man behind to attend to the great call of humanity. 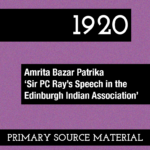 Whether Indians or British the nature of the supreme considerations of duty remain unchanged, and Indian students of the Edinburgh University did not lose time in forming an Ambulance Corps to assist in the relief of the sick and the wounded. The war had not been more than two months old when a body of over forty Indian students were drilling at the High School Yards under Captain Inch. During the progress of their work in this direction, it happily occurred to the authorities that their services would be most useful in attending their own countrymen, in hospitals, in the field, and otherwise. The climatic conditions being against the Indian soldiers in France, the hospitals were overflowing with Indian casualties, and the Edinburgh Indian Voluntary Corps had hardly had a month’s training when the first batch of thirty of its members were called to act as surgeons, dressers, and interpreters. At Milford, Brighton, Boulogne, and Southampton, Edinburgh Indian students were sent. But the supply was equal to the demand, for almost every day new students enrolled in the corps, and the system took more or less a permanent form in Edinburgh as a supply depot. 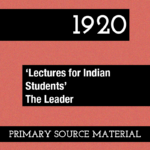 Later, one saw the Indian undergraduates of Edinburgh in Egypt, in Mesopotamia, in France, and even in Germany (and the writer states this from personal experience), at the hands of the Indian Office and the War Office authorities, surpasses all praise. Even colonels – who are somewhat severe people, I am told – received us on almost equal terms. Nor did we prove unworthy of our great Alma Mater, and when the tragedy was over, one was thankful to think that a solemn duty had been done to God and Man alike.